Do you hear the Sheldon sing? Take a close look at that photograph. Notice anything special about it? Anything… familiar? I don’t want to brag or anything, but yeah, I’m in there. That’s me as Enjolras, the villainous, very macho (but not as macho as Javert) leader of the ABC Cafe student uprising. This is, of course the all-important moment of the show when Javert, our hero, decides to infiltrate the treacherous band of students in a last, desperate bid to save the city of Paris. Later in the show, my character Enjolras orders Javert’s death, but through a combination of skill, luck, and daring, Javert escapes the clutches of the evil students. And then Enjolras dies. 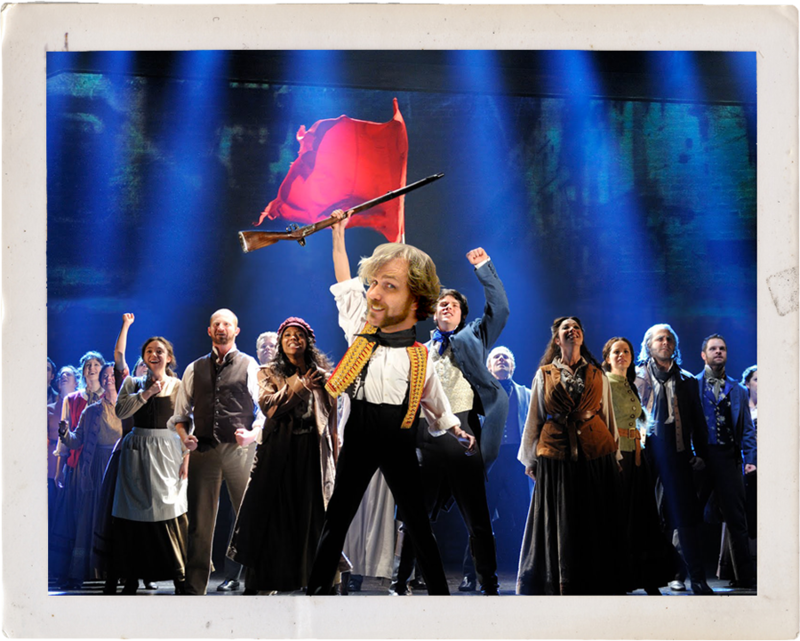 When I played the villainous Enjolras in the original Broadway cast of Les Miserables (Colm Wilkinson still owes me ten bucks), I learned a lot about acting. Mostly about how awesome Javert is, and how crappy every other character in fiction is, including Batman,Bilbo Baggins, and Jar Jar Binks. But you know what? This blog isn’t about me. It’s about the movie adaptation of Les Miserables, and what I thought of it. I know Les Miserables like the back of my hand, and let me tell you that the Les Miserables of the movie in no way resembles the actual Les Miserables. And nothing annoys me more than when a movie adaptation does not rigidly adhere to its source material. I saw Les Miserables on Christmas eve, and it was brilliant. I’ve been a fan of the show for twenty years, and I can honestly say that this movie exceeded every expectation. It was powerfully moving, and though there were some hiccups (namely the absurd casting of Russell Crowe as Javert), the film was everything I’d hoped it would be. As a singer I had a few quibbles about the vocal performances: namely that the majority of the principals were not particularly strong singers. Anne Hathaway and Samantha Barks were probably the best out of the bunch. Aaron Tveit was great as Enjolras, and Hugh Jackman was moving (if not particularly nuanced) in his vocal performance as Valjean. The roles of the students were filled out by actual West End performers, so all of them were great. The only gripe I had – a grip shared by many, I think – was the baffling choice to cast Russell Crowe as Javert. He pretty much tonelessly barked his way through the majority of his numbers, and since Javert is my favorite role, it was kind of a bummer. But all of that being said, the whole was definitely greater than the sum of its parts. The cinematography was really tight, with a lot of close ups on singers during the emotional moments. I know some people didn’t care for that as a directorial choice, but I think that the close-ups really highlighted the intensity of emotion. You can’t get that on a stage, and I think it worked really well. Anyway, go check it out! It’s an amazing film! Happy New Year, friends. Be well.